help! my travel days are over! You just had your first baby and everybody around you assures you won’t cross any borders (cities nor country) for years to come. 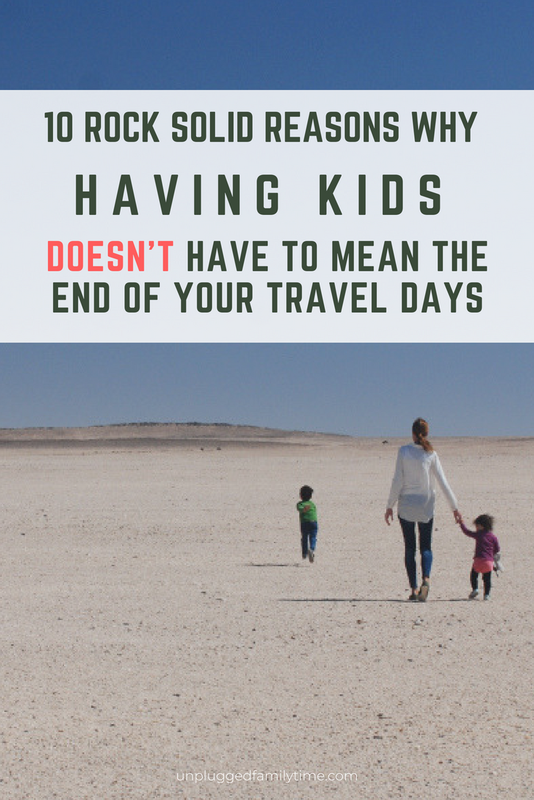 Because you shouldn’t travel with kids. The experience is wasted on them and they won’t remember. They won’t get anything out of it. Even thinking this raises eyebrows around you. Seriously, you shouldn’t travel with young children, because they might get sick. It’s not responsible. Moreover, little ones need routine. Travelling is too stressful and tiring for them, too many new impressions, too many unknown variables in a day. What if you won’t be able to find the food they’re used to? What if the train breaks down, what if the bus is delayed? But there are still so many places I want to see, so many cultures to discover, people to meet! The desperation takes over. You are totally on cloud-nine with your new born, but it slowly starts to sink in, you are chained — you officially have settled down. No more spontaneous last-minute trips. No more sampling local delicacies in crowded bus stations. No more trekking far-away places. What if I told you, you can take a deep breath and relax? 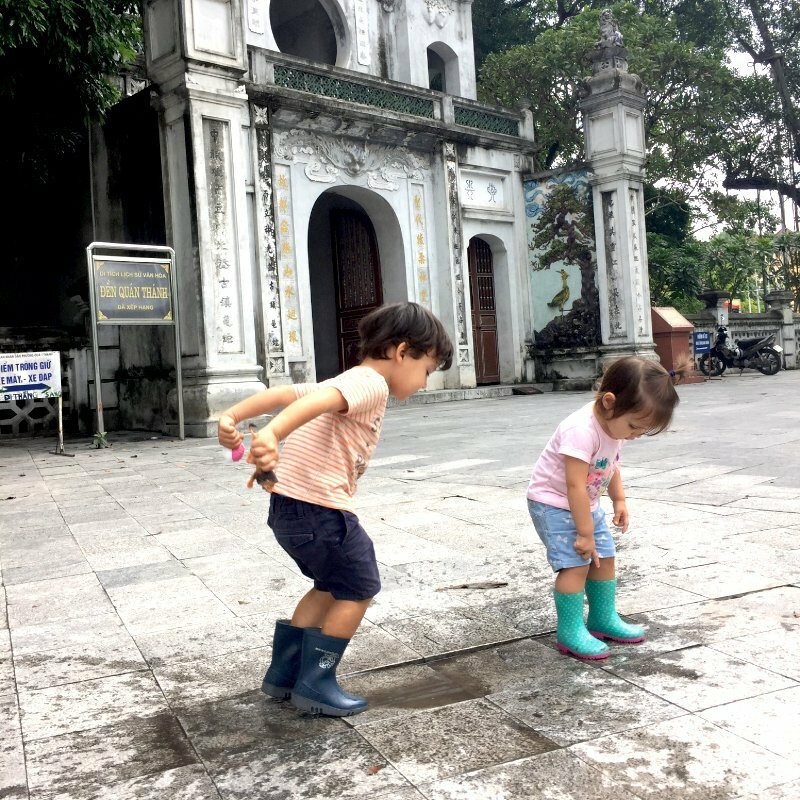 What if I told you, that travel is the ultimate activity that should top every parent’s priority list? What if I told you that travel is THE most effective, fun and rewarding way to teach your kids life skills, to encourage them to grow into independent, kind and confident people? Having kids doesn’t magically wipe away any long-held dreams of climbing the Eiffel Tower, trekking the Maasai Mara, or sampling the best pad thai in the planet with a view of the Indian Ocean. If you’ve got an unquenchable desire to explore more of the world, don’t let your kids stop you. Bring ’em along. My kids are aged 3 and 5 and we have travelled to over 12 countries, across 3 continents. We’re about to embark on our next extended trip to continent nr 4, Australia. Not because I’m selfish and don’t want my kids to stop me from travelling, so I drag them anywhere. No, because I have experienced first hand what being on the road, spending real face-to-face time together can do to a family, to the interconnecting relationships and the individuals. It’s humbling, mind-blowing and exhilarating all at the same time. And incredibly addictive. I wish every parent could experience that level and depth of quality time & mutual understanding. I wouldn’t want you to miss out, just because the whole world around you tells you you’re crazy when you’re packing your bags. And you might have started to believe them. Many friends have told me the same thing after a long family holiday: that they truly bonded with their children, that they got to know their kids again, understand what makes them tick, why they behave the way they do, say the things they say. They’d been reacquainted with their children. It’s a hard truth. What fast-paced society are we living in, that we do not get these moments in our daily lives, too busy with work, distracted by incoming messages on the phone during dinner time? Two-thirds of conversations between parent and child are about daily routine. And only a quarter of children say they talk to parents more than once a week about something that matters. 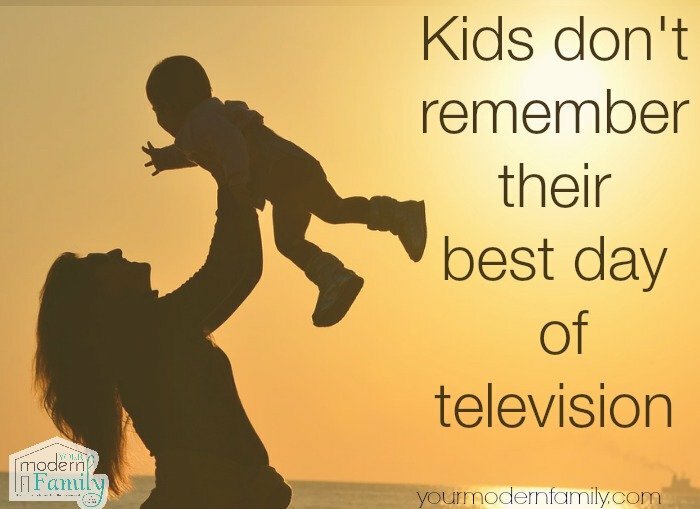 Kids deserve our undivided attention. It sends an important psychological message: I want to spend my time with YOU. Spending time with you makes me happy. This message directly enhances self-esteem and is vital for bonding. Kids don’t need you to be a superhero. They just need you to be available. Maybe you didn’t realise this, but travelling with small children is cheap, so don’t let limited finances stop you. On flights, under 2’s travel for free and if you’re planning to travel by car, they’re tiny so you can get away with a small-sized budget option. Most accommodations lodge your children for free (if they don’t, book another one that will). We always bring our own travel cot and ask for an extra bed in the room. This becomes more challenging when kids grow older so take advantage now. Restaurants will allow them to eat for free or have affordable kiddy menus. And they are not big eaters anyways, so most probably they just snack from your plate. Most importantly, your kids are not in school yet! This is a massive advantage in terms of travel cost reduction. It gives you the flexibility to travel outside the busy tourist season, saving on soaring peak season prices. And it allows you the opportunity to enjoy last minute discount deals, both great for your wallet and your sense of freedom. Many children are fussy eaters and although this is normal, it’s not always easy for parents to handle. When you’re rushing home from work to get dinner on the table in time for kiddie’s bedtime, it can be challenging to cook up a healthy homemade option. And when your child doesn’t want to touch your carefully prepared meal, it’s tempting to bribe them with dessert, if they at least take a bite. We’re not always ready for the battle, we don’t always have the time or patience to sit it through. And sometimes we are just too tired. Every list with tips to help your picky child eat, swear by making mealtimes fun. During your family holiday, when there are no work or social obligations to juggle, you can take all the stress out of the eating experience and turn mealtimes into enjoyable events. Join the locals on their tiny blue plastic chairs on the street corner, make your choices by looking at your neighbours plate instead of the menu, take a stroll over the food market, joke over the funny looking vegetables and gather your ingredients for a scrumptious picnic in the park. Visit a picking garden and allow your child to select their own fruits. Insert trips to the ice cream parlour and sweet shop, follow wafts of freshly baked goods to find your next lunch location. Cooking courses and sampling menus are also excellent to expose your toddler to different types of dishes. Key is to ensure eating stays associated with fun. And before you know it, your child starts asking to try some exotic looking vegetable. One day in our holiday home in Zanzibar, a carpenter came to deliver a study table. We sat down for a chat and my son, then 3 years old, was hassling him for a play. “How come he is not afraid of me?” the carpenter asked. Reading the puzzled look on my face, he added “because I’m black, I mean. I have met many white tourists’s kids and they’re always scared”. In this world so full of boxes & labels and passing judgement on one another, my son doesn’t see colour (nor shape nor size for that matter) and I’m confident it’s a direct consequence of his exposure to so many different cultures, traditions, religions and races. Helping kids to expand and improve their vocabulary is a priority for many parents. A strong vocabulary helps foster understanding, communication, and reading ability. Research has shown children learn new words by hearing a word repeatedly, hearing the word spoken by the important people in their lives and hearing them in a meaningful context. Travel ticks all these boxes. It provides an abundance of opportunities to playfully introduce new words and talking points. Discuss the weather, the local food and its surprising flavours. Ask your child about their new surroundings, the people they see with the clothes they wear and the vehicles they drive, the unfamiliar smells they smell. 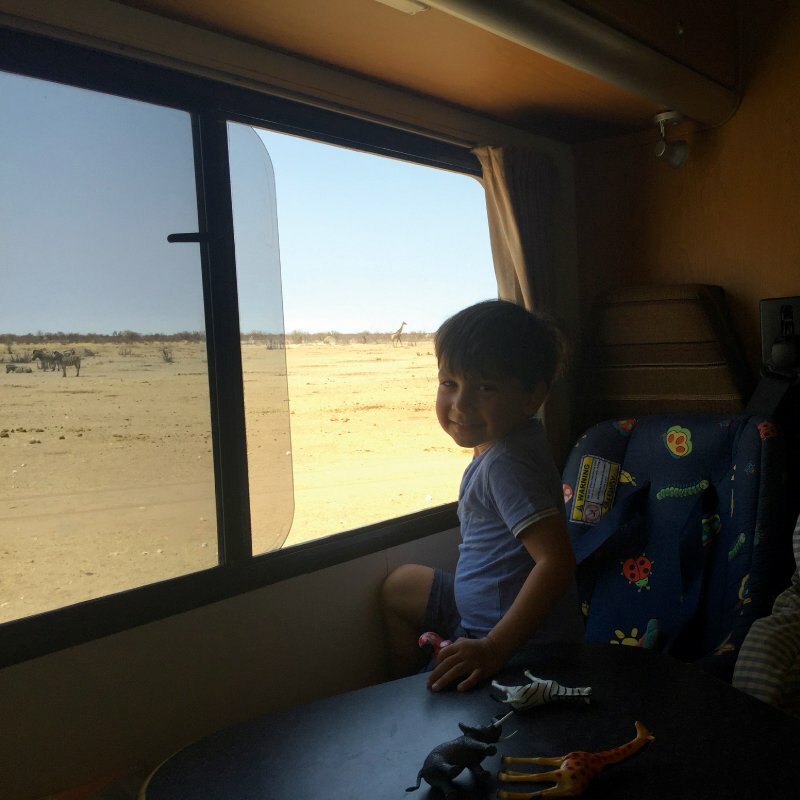 When we packed up our 1 and 2 year old for a month self-drive safari in Namibia, I packed plastic toy animals for all the ones we were hopefully going to spot. Having these at hand when looking at a towering giraffe, increased their understanding significantly. By directly visualizing the new animal word, both in real life and in miniature form, the word giraffe was added immediately to their vocabulary. Upon return I had a 1.5year old with a vocabulary covering the animal kingdom. If you’re more into Science, this one is for you. Travel advances brain development in children and builds concentration skills. Dr. Margot Sunderland, a child psychotherapist, explains: “because on a family holiday you are exercising two systems deep in the brain’s limbic area; the PLAY system and the SEEKING system (Panksepp 2016). The brain’s PLAY system is exercised every time you bury your child’s feet in the sand, tickle them on the pool lounger, or take them for a ride on your back. The brain’s SEEKING system is exercised each time you go exploring together: the forest, the beach, a hidden gem of a village. So there you have it. Travel is an investment in your child’s brain with an incredible ROI. We are blessed with what we have, we live in a safe, clean city with tremendous facilities, drive our big cars around, enjoy outstanding health care and shop in overstocked supermarkets. 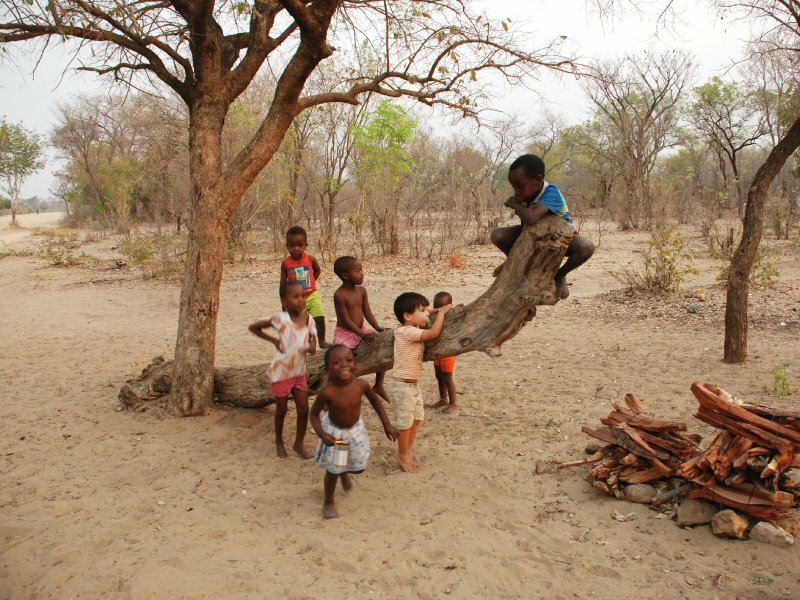 Travelling to places of poverity teaches children appreciation by showing the value of what they have and others don’t. Last July we went on a self-drive safari in Tanzania and while driving over sandy dirt roads through an elephant herd, we passed a small dusty village. We were planning to spend the full day in the reserve, so the lodge had made us a packed lunch each. Every box was filled to the brim with sandwiches, eggs, chocolates, cookies and fruit, enough for 2 adults to share. When passing the little wooden shacks, we stopped the car, rolled down the window and handed 2 boxes to a 4-year old boy dressed in dirty rags. He gave me the biggest bright smile and waved us off. Seconds later my son burst out in tears: you gave my cookies away! We often talk about that moment and that boy, that short 10sec exchange left a deep lasting impression, an experience so powerful I couldn’t have taught him the same lesson surrounded by the comforts we take for granted. We spend approximately 6 months of our lives waiting. Waiting in line, at traffic lights, for our significant other to get ready, for the bus, train, at airports. The art of exercising a positive attitude while waiting is a truly valuable life skill. Patience works like a muscle, it needs to be trained to reach its full potential. Travel provides lots of opportunities to train patience’s stamina and strength. You’ll be waiting to check in, at restaurants to enjoy dinner, at the watering hole to spot animals, at the local theatre for the tribal dance show to begin. Maybe the train breaks down, the rental car isn’t ready, the flight is delayed. The secret to developing patience in children is to creatively fill these waiting moments (or better yet, have your kids fill them for you). Transform waiting from a chore into their favourite activity. The more you exercise your muscle, the more it becomes part of your personality. Practice makes patient. One in six fathers say they do not know how to play with their child, according to a survey carried out by Playmobil UK. Many new parents struggle to fill the day with activities. Especially before kids can walk & talk properly, parents can be at a loss how to occupy their baby. A baffling number of 9 out of 10 parents use electronic toys to entertain their offspring. When exposed to a fresh new environment, inspiration comes pouring in. Games and activities hand themselves on a shiny silver platter. 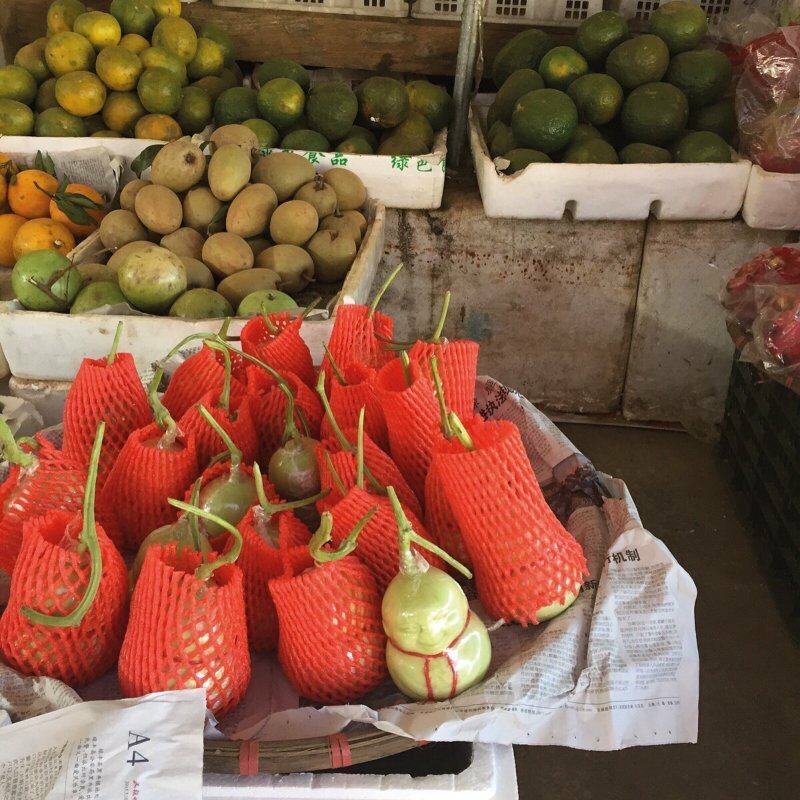 Hunting treasures at bustling markets. Racing each other downhill during a mountainous walk. Checking funny looking street signs and guessing their meanings. Playing a game of tag on the central village square. Combing the beach for seashells or tracking forest trails for footprints. Best thing is, it doesn’t require much effort. All you have to do, is get out there and let your new surroundings do the rest. Suddenly there aren’t enough hours in the day. Life with toddlers is hectic. Days are overwhelming, nights are short. With so many different roles to play, spending quality time with our partner is often the one thing that unwittingly slips down our priorty list. Romantic candle light dinners with long conversations over a glass or two become a rarity, we press the pause button on our relationship ‘until they are a little older’. Imagine, you just tucked in your kiddies and kissed them goodnight. You step out the room onto the terrace, a gust of warm sea wind messes up your hair, sounds of crashing waves and a small table set with cheese & wine. When on holiday with toddlers, your evenings are all yours and yours alone. No social obligations or prepping for next day’s meeting. No yoga classes or boot camps screaming for participation. No coverage to feed your social media addiction. Nothing stops you from giving your full and undivided attention to your partner. If you’re up for it, and babysitting is offered, you might even head down to the bar for a drink together. Enjoying each others presence deepens your relationship. You will feel like newly-weds on their honeymoon. I can assure you, you will get jealous remarks upon your return! Travel brings new perspectives, it broadens horizons. But don’t take my word for it. You know it’s true. You’ve read every reason on this list and they make sense. You’re feeling relieved. Supported in your feeling that your travel days aren’t over, you’re only at the beginning of a new exciting journey with new travel companions. You arrive happily back home, exhausted but full. Overflowing with stories to tell & piles of dirty laundry to prove it. You need to decide which photos to print & frame, a seemingly impossible task with too many moments to choose from. For years to come, flashes of adventures will pop up in conversations: remember when those elephants were passing through our tented lodge? Remember that dinner on a streetcorner in Hanoi? Remember how freezing we were in that small port town in Namibia? For years to come, these stories bring smiles to your faces. You’ve built lasting memories together you’ll cherish forever. And then you suddenly see your toddler showing new behaviour you’re sure they’ve picked up on the way. More curious, more patient, less shy perhaps. You’ve allowed your children to learn valuable life skills in the best possible way, through firsthand experience. Parenting shouldn’t keep us from travelling. It should inspire us to go out there and make memories that last a lifetime. The world is your classroom, there are lifelessons to be taught and learned around every corner. So go ahead, you can do this. Pack those bags and GO. Karin Louzado is a family travel expert who supports others parents taking the effort out of travelling. A Dutch expat mum of 2 toddlers, she explored over 45 countries without losing her mind, wallet or kids. Download your free guide The Zen of Toddler travel and learn how to simplify family travel. Hello! 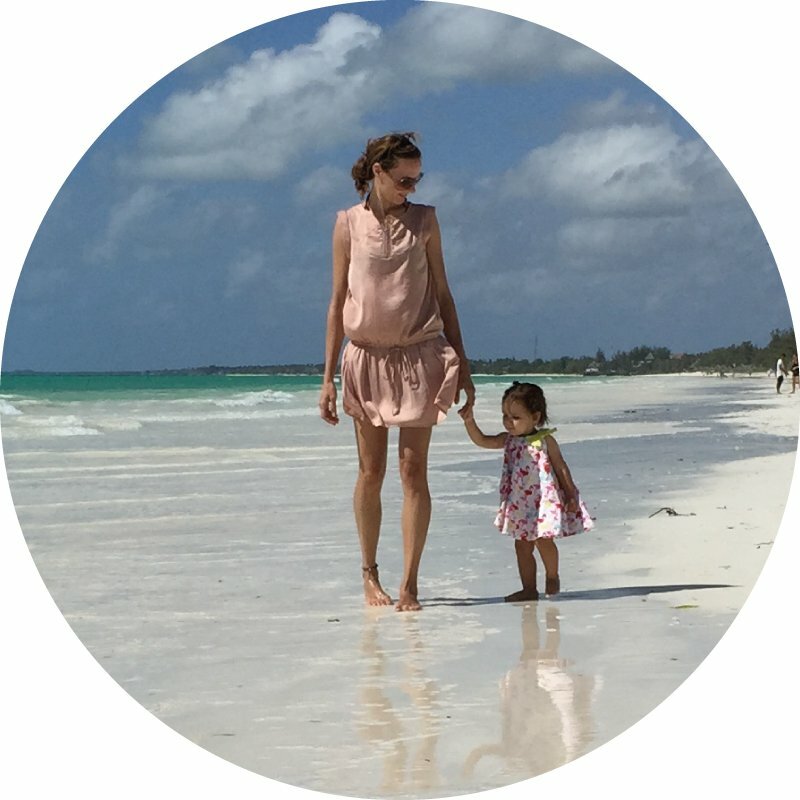 I’m Karin, a Dutch expat mum enjoying the challenge of parenthood in this digital age. Creating unplugged family moments through undivided attention and face to face interaction. This spring challenge takes the hassle out of planning your unplugged family time, so you can spend more time having fun. 12 weeks, 12 activities = 12 opportunities to make memories together. Enter your details below and each Monday I'll send you next week's challenge, along with occasional tips for unplugged family time. Yes, I take the challenge! I don't send spam. I never share your information. Unsubscribe anytime.